We share our views on topics of interest to cats including human training strategies and tips, food stealing ideas, what kinds of cat-nip give the best high and why, and new toys we discover. We'll try to update regularly, but our human typist is also busy giving cat laps and chin rubs. All cats are awesome, of course, but some cats are truly exceptional. Fritz the Cinema Cat enjoyed the admiration and friendship of an entire island. We are so fortunately to live in such a wonderful community. Please enjoy our story of a local feline hero. 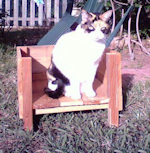 A wooden napping platform for cold weather shelter while sunning, a great DIY project for wood workers, and a lovely treat for the cold-climate indoor-outdoor kitty. Could also be a nice rustic indoor cat-bed. If your human has wood working tools, please check out this great build project for a cat scratching post - a strudy home made version of the carpet covered tower-of-power that every cat should own! What exactly is your cat trying to say when it puts its tail up like the flag on a mailbox? Or when you see your cat sitting with it's tail lashing it's sides? Learn more about the mysteries of the language of the tail. Practical advice for cats and humans, in random numbered list form! Housetraining a cat is almost effortless because most kitties learn to use a litter box easily, but sometimes after years of perfect litter box attendance, they decide to do their business elsewhere. Described by vets as 'inappropriate elimination', and probably the leading cause of abandonment to shelters, failure to use the litter box is a big problem for cat owners. We've compiled a list of 20 Things to try when kitty is avoiding the litter box. Selecting the right name for your new cat or kitten can be a big challenge. We offer 18 tips to help you find just the right name for your kitty. 10 Ways to entertain your kitty. Cats need lots of variety in their play, this list has ten things you probably already have in (or near) your home right now that can be used to keep your kitty busy playing and happily entertained. Do you have a lazy kitty who needs more play? Check out these NINE tips for encouraging your lazy feline to get more active. 8 Tips for preparing your feline companion in disaster readiness. Every pet-owning household should have an emergency plan to help keep your pets safe in the event of a natural disaster or extreme weather - try these 8 tips and links to more reading. 7 Ways to show your feline companion honour. Every cat deserves a place of honour in the home, and we've got some ideas on how you can show your darling the respect and recognition cats deserve. 6 Massage techniques and tips to help guide your learning the fine art of cat massage. Patting a kitty is well known to have health benefits for humans, including lowering high blood pressure and reducing stress related complaints. Playtime is not just about toys you know, cats can learn to play all sorts of games. Here are five quick tips to get you started devising games to pay with your feline companion. Cats are very organized, and there are a few household chores they like to help with - or at least, watch you do. If kitty wants playtime and you have stuff to do, check this list to see which chores kitty might like to help you with! Adopt a shelter cat. Cat ownership has been shown to have both physical and mental health benefits. Adopting a homeless cat, a hard-to-place cat, or a cat that's been at a shelter for a long time will immeasurably improve two lives in just one simple step. Cats are naturally flexible and they always remember to stretch after they wake up - see what you can learn about yoga from cats! For Earth Day we're considering ways we can reduce our carbon footprint, and offering a 'Paws for Earth' 5-step challenge to all our cat friends too! Course 101 - Five Do's and Don'ts for Training your person. Flick, Dot and Buzz rant to save the environment from bad humans, and encourage good humans to clean up their own little corner of the world. Anything in particular you'd like to read about? Please send us an E-Meow: e-meow@flickdotbuzz.com and let us know!